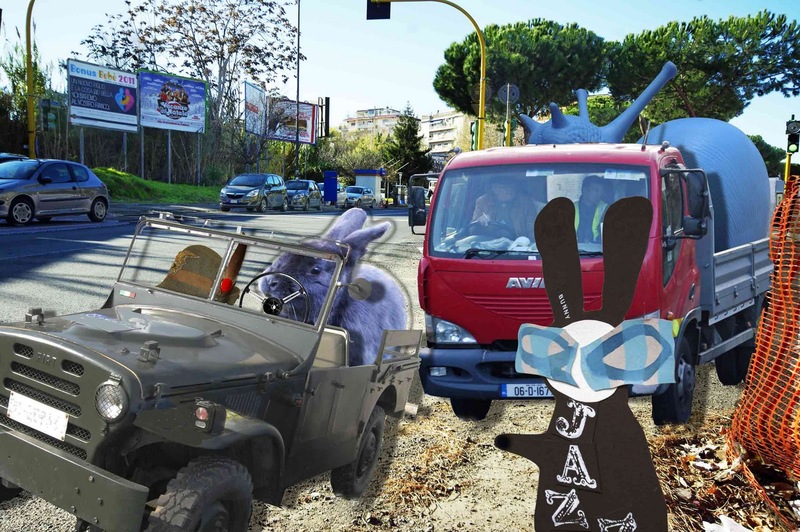 The Wabbit waited patiently at a junction on the Via Gregorio VII until Franco and Snail hove into sight. Then, taking over the intersection as if he was a policeman, he waved them all through. “Look the other way, you’re not in Cornwall now!” he yelled to Snail’s driver and his mate, the two Cornish pilgrims. “Thanks Luvver, are we here?” said the driver as the truck lurched to a stop. “Yes, you can park in the Big Coach Park,” said the Wabbit and turned to Franco. “But what happened, Franco? What held you up?” “I had to replace the spark plugs and set the points,” said Franco. “Yes,” said Snail, “and we had time for a lovely snack at a roadside cafe.” “On a cardboard tray?” asked the Wabbit. “I had two!” said Snail and he wiggled his antennae. “Anywhere to get fags around here?” asked the driver’s mate. “At the tobacconist across the road,” said the Wabbit, “and you can also get a lottery ticket and scale models of planes and helicopters, which are better for your health.” “l’ll bear it in mind my lovely," said the driver’s mate and he jumped out. The Wabbit watched him leap around, dodging the traffic, and he flinched as a bus narrowly missed him. “Buses have right of way in the middle lane,” he shouted and covered his eyes. “Where’s our camp?” asked Franco. “Over there by the ecological car wash,” said the Wabbit. “How can it be ecological?” said Franco. “No water,” said the Wabbit. “I can’t believe that, Sir,” said Franco, forgetting to address the Wabbit informally. “Neither does anyone else, I’ve never seen a soul use it,” said the Wabbit.